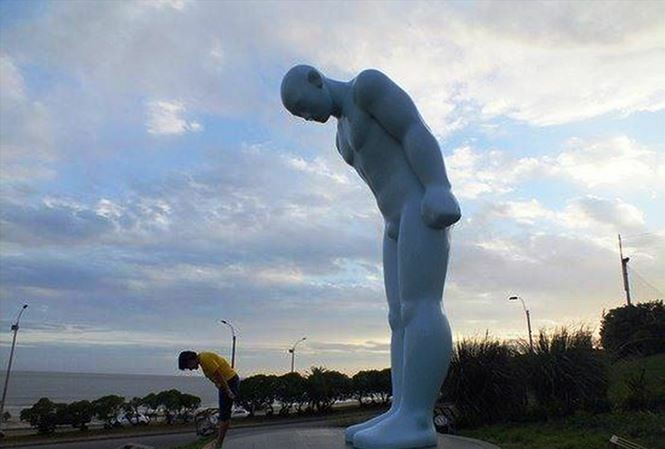 The central city of Hue is trying to find a way to properly display a statue presented by a South Korean city. Hue and Namyangju cities have established the friendship and co-operation since October last year. Namyangju governor Cho Kwang Han recently expressed his interest to present Hue with a sculpture entitled Greeting Man representing peace and respect to mark the two cities’ friendship. However, the offer has become a headache for Hue authorities with the wonder whether to receive the gift and where to display it. The South Korean side suggested putting the statue at the Hue Imperial Citadel, Dong Ba Market or the park in the north of Huong River. Nguyen Xuan Hoa, former director of Thua Thien-Hue Province’s Department of Culture and Information, supported the gift acceptance, but he noted that it is important to consider the appropriate location to display the statue. Researcher Nguyen Dac Xuan shared the same ideal with Hoa, saying that Hue had ever held many international sculpture exhibitions during Hue festivals. At present, many foreign sculptures are still being displayed in the city. Xuan added that the Greeting Man statue should be situated at the pedestrian road along Huong River decked with a rare and valuable wood as it is part of the project on the river planning project funded by South Korea. Ho Dang Thanh Ngoc, head of Hue Union of Literature and Arts Associations, said that the sculpture should be placed on To Huu Street which is quite big and suitable for the work’s size. Nguyen Dung, vice chairman of Thua Thien-Hue Province People’s Committee, said that local authorities will collect the opinions to decide the most appropriate for the statue display.